Do you want to start a home health care business and bill Medicare? Our home care consultants will complete your 855A Medicare Application on behalf of your home health care agency, including all accompanying forms and required attachments. We will also prepare your civil rights package to include all required attachments. The 855A Application is the first step toward achieving home health care Medicare Accreditation for your home health care agency. Once your Application is completed, you will submit it to CMS along with the 855A Medicare Application Fee. Our home care business consultants will tell you everything you need to know and expect prior to submitting yourApplication. Medicare will require that your home health care agency meet an IROF requirement, meaning your home health care agency will need a specific dollar amount in the home health care agency's bank account before Medicare will approve the 855A Medicare Application. We will help you identify the IROF requirement in your area and assure that your Application is completed correctly and approved. 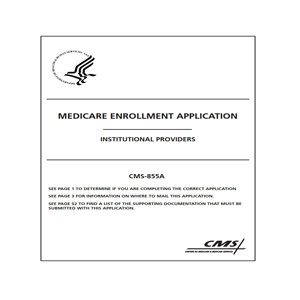 Medicare will process your 855A Application for nearly 4 months before it's approved. Once it's approved, you can then proceed with the process of CHAP Medicare Accreditation. For more information on the 855A Medicare Application or the CHAP Medicare Accreditation process, contact our home care consultants today.